Ten people were killed when security forces opened fire on a funeral procession today. 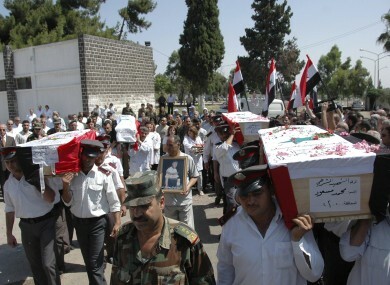 TEN PEOPLE WERE killed when Syrian security forces opened fire at a funeral procession today. The killings brought the death toll in the city of Homs to about 50 people since Saturday, according to a range of activists, human rights groups and witnesses. The shooting took place outside the Khaled bin Al-Waleed mosque shortly before noon as families held funeral processions for 10 people killed on Monday during a security sweep. A mother of one of the men being buried was believed to be among the victims. Syrian troops have been conducting operations in Homs since late yesterday following reports of a wave of sectarian killings that left around 30 people dead during the weekend. A resident told The Associated Press by telephone that Homs was “a ghost city”, with most people hold up inside their homes. Email “Syrian forces open fire on funeral procession”. Feedback on “Syrian forces open fire on funeral procession”.